Accès toute l'année au lac Cherokee. Faites de cet endroit un endroit merveilleux pour se détendre avec la nature. Une escapade pour les grands groupes avec 5 chambres, 3 salles de bain sur paisible lac Cherokee. De l'autre côté du lac depuis le parc d'État de Panther Creek, cette maison de 4 000 pieds carrés offre de belles vues. Une grande cour arrière avec accès à un quai privé, notre maison est un rêve pour les familles et les couples. Il y a une terrasse à l'étage avec accès au plan d'étage ouvert pour les groupes de divertissement. La suite principale offre sa propre vue sur le lac privé. Deux des autres chambres ont des lits queen super confortables avec une vue sur le lac. La quatrième chambre a deux lits et la cinquième chambre a deux lits superposés pour les enfants. Il y a un canapé-lit supplémentaire dans la salle de loisirs. Le foyer extérieur et la rampe de lancement privée facilitent le divertissement en journée et en soirée. Il y a un parking pour un maximum de quatre voitures ou 2 voitures et une remorque de bateau. Juste une heure de Great Smoky Mountain National Park et Bristol Motor Speedway. Faites une excursion d'une journée à Gatlinburg, Dollywood, Knoxville ou Biltmore Estates. Célèbre pour les tomates du comté de Grainger. Le lac Cherokee est l'un des lacs de l'Autorité de la Vallée du Tennessee (TVA) avec des activités de pêche et de loisirs aquatiques toute l'année. Les retraites sont amusantes au Bear Den South! Êtes-vous fatigué de courir après les enfants? Le travail vous stressant? Avez-vous besoin d'une pause et aimez scrapbook, couette ou se détendre avec des amis. Venez nous rejoindre pour la retraite de Mama Bear à Bear Den South ou organisez votre propre retraite avec des amis! Vous pouvez disposer sur le pont et lire, scrap ou couette dans la grande salle de loisirs, dériver sur le lac dans le kayak, ou s'asseoir dans la station de relaxation. Joignez-vous à nous pour une des retraites de Mama Bear's et servez-vous des repas faits maison, des biscuits aux pépites de chocolat chauds la nuit ou des smores près du foyer. Profitez de plus de 48 heures pour créer votre contenu. Vous pouvez également planifier votre propre retraite, apporter votre propre nourriture ou nous pouvons mettre des plats dans le réfrigérateur pour que votre groupe puisse cuisiner lorsque vous êtes prêt à manger. Salle d'artisanat a l'éclairage des tâches, tables de six pieds, des chaises confortables, une kitchenette pour les friandises, cheminée, et sa propre belle vue sur le lac et les montagnes. The property, views were amazing. We appreciate you letting us know about the items missing from the house and will check into them. If you ever need something please let our maintenance team know so we can correct them while you are there. Thank you for staying at Bear Den South. Only a 4 star because it rained 2 days and the lake level was too high for me. Great place to stay. Our third summer at Bear Den and everyone had a great time, even with the rain. House is large, open and has everything you need. We had 6 adults and 7 children, ages 18 months to 13 years, and never felt cramped. If you have a large group, this is the place for you. Great location. Very quiet neighborhood on a peaceful cove. If you are tired of going to a crowded lake where boat traffic is a problem, come to Cherokee. You can stop in the middle of the lake, turn of the engine and go swimming with no worry about getting run over. Your kids can ski or tube without worry. Didn't fish much, but my son caught the largest bass of his life, around 4 lbs. Hope to return next year. Great setting and room for everyone. The home was fantastic in terms of accommodating large groups and access to the lake, which we thoroughly enjoyed. We very much enjoyed our week, and would likely go here again. There was a lot of required cleaning (no cleaning fee though, which is nice) including laundry, taking trash to the dump, and sweeping we were not expecting, and that can delay an early departure if you need one. We also did not find a paddle boat, and a couple of the TVs/DVD players did not have a signal to them. We also could not get the coffee makers to work either. Of course, operator error is a possibility. These were minor details, and overall the home was great, and the week was fantastic. I would recommend this home to anyone wanting a relaxing week at the lake. Thank you for the review. We really appreciate your feedback. I am sorry you had trouble with the TV DVD and the coffee maker. We are getting a new coffee maker! Unfortunately the peddle boat was stolen. Also as you pointed out you didn't see the house rules prior to staying. I will have to start sending the house guidelines instead of relying on the attachment with VRBO. Guest have an option to bring their own sheets and towels if they don't want to use the house ones. We do hope you will join us again. My family and I really enjoyed our time at Bear Den. The location was perfect. The home was just the right size for my large family. The DSL left a lot to be desired but with the home's rural location it should be expected. In some areas of the country (I used to own a vacation home in rural West Virginia), DSL is the only option when it comes to an internet connection. We did learn, via the local paper, the area hopes to have broadband installed in the next year of so. Fingers crossed. The home also does not have access to cable TV. The owners get their TV service via Dish Network. There were times, during large thunderstorms, the signal would go out but not enough to really negatively impact our stay. After all, we came to the lake to escape and reconnect ... not spend our time watching TV. We did encounter an unexpected issue during our stay but it was corrected without too much inconvenience. In fact, the only inconvenience was moving the outdoor gas grill and deck chairs to another location on the deck so we could continue to enjoy the large deck. This is the only issue I felt warranted the four star versus five star rating. And I struggled with picking a four star rating ... but felt it appropriate based on the issue and its resolution. I would recommend this property to other large families looking for the perfect place to reconnect and decompress. It really is a great property in a great location. 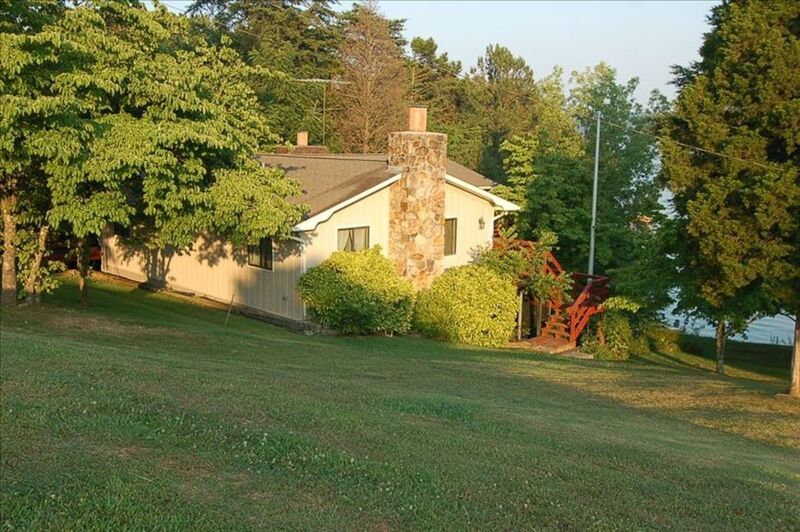 In fact, we are already planning our 2019 Family Vacation and, if we return to Cherokee Lake, we'd want to rent this home again. We are so glad you enjoyed the house and look forward to the opportunity to host you and your family again. The place is a blast.. Thanks for everything. See you in 12 months.. Thank you! We appreciate the feedback. Looking forward to seeing you again. We had a great time with our family, nice house for a large group ,plenty of room to spread out. We are so glad you enjoyed your stay. We hope you will call us again when you are in the area. Cherokee barrage du lac a un grand parc et plage de baignade (cailloux) environ 15 min. un moyen. Gilmore quai est là pour la prochaine grande crique de carburant et de pêche. Location de bateau est disponible sur le lac. We require a short term agreement with the deposit at signing. Balance due 30 days prior to rental. Welcome letter with information on how to enter the property will be e-mailed. Monday prior to arrival. No Pets and Non Smoking property. June, July and August we rent Saturday to Saturday for Family Vacations.